"A trip to Paris inspired me to study sculpture. Since that time, I have studied with Don Gale, Terry O’Donnell at El Camino College, Martine Vaugel Sculpture Studio in the Loire Valley, Robert Cunningham at the Robert Cunnungham Studio in Culver City, now known as The Teale Street Sculpture Studio, where I am currently studying." My first real drawing at 9 was, according to my astonished grandmother, a perfect reproduction. I took up a challenge I read on a matchbook cover “can you draw the lumberjack?” as a fluke, not knowing I could actually do it. I started illustrating my book reports and my first paid job came from a friend who offered me ten cents per drawing to add to her class papers. In high school I took a life drawing class and was informed some years later that one of the drawings from that class was chosen to hang in the state assemblyman’s office. I traveled to Israel in 1973 for a one-year overseas program but ended up staying for three and studying English Literature. Strange drawings all of a sudden started to just spew out of me early in ‘75, which were unlike anything I had done before. They seemed to draw themselves and I remember feeling “possessed” and frightened and unaware of their artistic merit until enlightened by a painter friend who cautioned me to never throw away any of my drawings. So I started to take them seriously but not really interested in engaging with the force that was doing the drawings. One night in 1986, I dreamt I was walking on a street in Tel Aviv when I turned a corner and suddenly found myself in front of a multi-level staircase with wrought iron railings connecting to different streets. 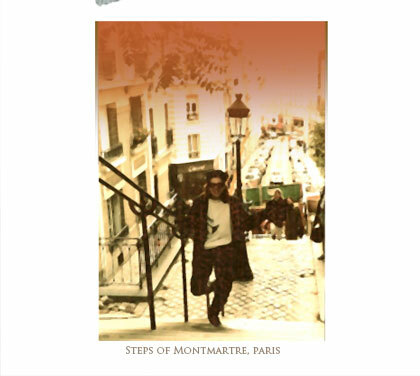 Somehow I knew it was Montmartre in Paris. At the time, I had been questioning which “door” of the arts I should follow as I was drawn in a few directions. Six months later, I won two roundtrip tickets to Paris, notified by letter dated on my birthday. I felt the hand of destiny and was curious where it would lead. In Paris I was mesmerized by the life-size sculptures populating the gardens, parks and museums. How uplifting to be walking amongst these gorgeous figures assaulting one’s vision! How lucky Parisians were to live surrounded by such beauty. One day as I was circling the heroic poses in the Tuileries Gardens, snapping photos at every angle, a man approached me, charmed that I was so captivated by a sight locals take for granted as they casually stroll by. Naturally, I decided I must go to Montmartre in case there was a clue. After visiting the Sacre Coeur church, my friend and I exited through the rear, which put us in front of a very long staircase. I didn’t immediately make the association but while descending the stairs I got a queasy feeling, almost like déjà vu, and told my friend I felt kind of weird. She said, “you think that’s strange look down there,“ pointing to the bottom of the stairs where the name “Cheryl” boldly stood out in white letters atop a black door. Upon closer inspection I saw that it was the studio of a ceramic sculptor. I took that to be the answer to my question. It was further reinforced, when back in Los Angeles, I saw a monumental figurative sculpture, reminiscent of Rodin’s “Thinker,” in the lobby of an office building where I had a job interview. I just happened to stumble upon it during the time it was being showcased there. It took me some time to track down the artist whom I found teaching a bronze-casting course at Otis Parsons and I enrolled in his class. Later, when Don Gale started teaching classes in figure sculpture at a studio in Culver City, I began to study sculpting from the live model. When he left to New York we were fortunate to have Robert Cunningham take over and I studied with him for many years before he left to devote himself full time to his own commission works. In 1991 I was able to go to France and study for one month in the Loire Valley with Martine Vaugel who at the time was head of the sculpture department at the New York Academy of Art. I continue to sculpt and study at the same studio, now known as The Teale Street Sculpture Studio. I am grateful to have had the opportunity to study with such talented artists who have devoted themselves to the instruction of figurative sculpture and who are my mentors and friends.